When I was teaching Reading Recovery, one of the great lessons I learned as an educator, parent and co-existing human being in a world of social beings, is that we can not assume that others think the same way we do about anything, reading included. As teachers, meaning can feel like the ‘given’ part of reading. Many kids in this situation have nothing to anchor them, no starting point. Sometimes there are students who know all of their letters and sounds, even hundreds of sight words, but still have no way of relating to or finding meaning in what they are reading. They stumble through, one word or sound at a time, but have no idea what they have read after all of the decoding work. We focus first on teaching reading for meaning, because understanding what we have read is the end goal, and what we have read previously gives context to help us solve that which lies ahead. Regular familiar reading also aids in the development of fluency and comprehension. Use wordless picture books regularly in your classroom and encourage your students to make up stories to go along with the pictures. Be thoughtful about choosing high-interest books, books that relate to the child’s life, some s/he’s read before, draws other life connections. Discuss the importance of reading making sense. If we see pictures of astronauts in space, it probably wouldn’t make sense for us to see the word dinosaurs on that page – especially if we had seen a picture of a rocket on the front cover and astronauts getting into it on the first page. Let them catch you throwing a word into read-alouds that make no sense at all once in a while. Humor goes a long way! Encourage your students to listen to themselves when they read, and remind them that part of reading is being alert and listening to themselves to make sure the story makes sense! Visuals help. 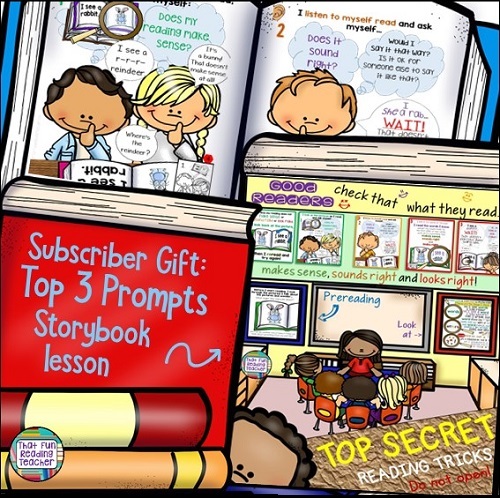 Click the images below to read more about the top 3 prompts and get these grab the Top 3 Prompts bookmarks free from my TpT store. I’m working on a storybook lesson / poster set, so be sure to subscribe and follow me to take advantage of my new product discount when it’s finished! This page from Read and Write and More: Spring is a fun way for kids to practice focusing on thinking about ‘what makes sense’ (meaning) while reading simple sentences.